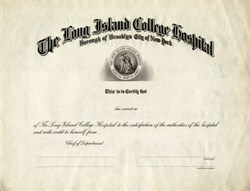 Beautifully unissued certificate from the Long Island College Hospital This historic document was printed by the American Banknote Company and has an ornate border around it with a vignette. 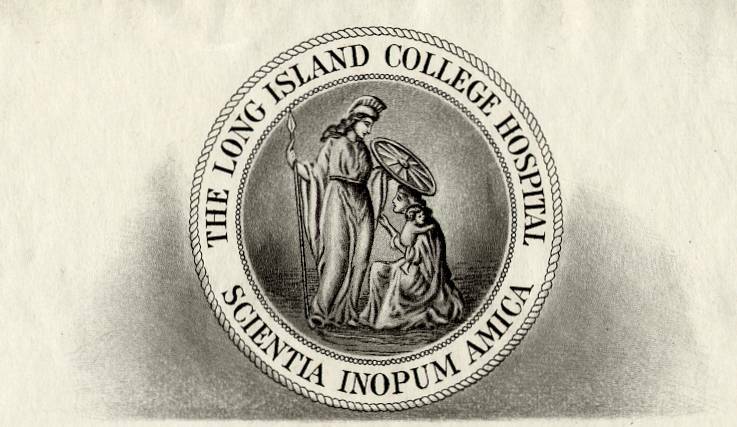 Long Island College Hospital (LICH) is a teaching hospital situated at Hicks and Amity Streets in Cobble Hill section of Brooklyn, New York. Founded in 1858, the hospital has 506 beds. In 1860 it introduced the practice of bedside teaching and it later became the first U.S. hospital to use stethoscopes and anesthesia. In 1873 it introduced the first emergency ambulance service in Brooklyn. Its collegiate division would later form the Downstate Medical Center, an academic unit of the State University of New York in 1948. The Polhemus Memorial Clinic, an eight-story 1897 tower that was part LICH until July 2008, is considered to be the first example of skyscraper hospital, anywhere in the world. Today it remains an academic affiliate of the SUNY Downstate Medical Center and serves as a clinical campus for medical students in the Downstate College of Medicine. The hospital was affiliated with the Continuum Health Partners. As of May 27 2011, Long Island College Hospital is now part of SUNY Downstate's University Hospital of Brooklyn and is called University Hospital of Brooklyn at Long Island College Hospital.